i must say, i adore the sweet and the simple, especially when it comes to dressing chubby cherub types. 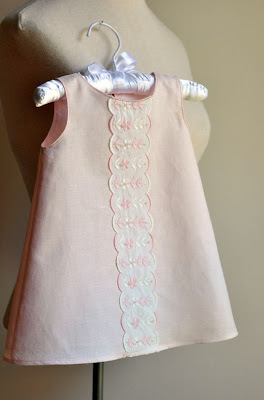 one random winner will have the chance to pick their favorite handmade baby dress (the trim details are sew cute)! katy's etsy shop, Sew Apropos is filled with lovely headbands, jewelry and girly dresses. she runs a household of darlings so i know she is an expert on the subject of all things pretty & princess. i can just imagine her drawers stuffed with little girl hair ties, frilly ribbons, colorful clips and frilly lace (and in a few years, loads of hairspray, earrings and makeup). i am glad i never outgrew playing dress up. 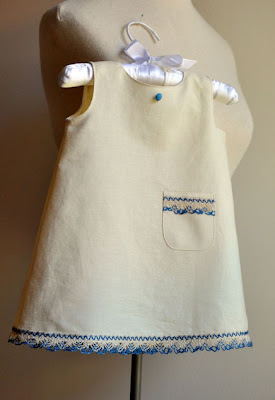 if you'd love a sweet + simple baby dress, fit for any doll faced sweetheart, simply leave a comment to enter to win. tell me one of your favorite outfits you wore when you were young. me? i wouldn't leave the house without my doll's navy peacoat. i loved attempting to wear it, leaving my dolly out in the cold to fend for herself. i usually paired it with my pink tutu and heart tights. being the youngest of seven children, my mother did not put up a fight. comments are open until saturday / june 13 / midnight / mountain time. the winner will be announced next week. thank you, katy, for bringing simple back. visit katy's darling shop + blog. I had a rainbow pastel night gown that I refused to take off - it was too long for me and had to be repaired multiple times because I would trip and step on the hem. I wore it until it was too short and too tight to get over my head. Those dresses are so sweet! I loved wearing fluffy dresses when I was little. It seems like I wore one every day. Amazing giveaway! My favorite outfit was my "alice in wonderland" dress! It was blue and I thought it looked just like Alice's! I REALLY hope I win! I loved my oversized sweater with scotty dogs on it and my black stirrup pants. I remember having to write a descriptive essay and choosing this outfit! Whew--I think I probably had no fashion sense at all. But I loved it. I think I'm in love! These dresses are simple and perfect! Oddly, I hated dresses as a little girl, but any kind of graphic tee (I had a Fraggle Rock one that was awesome!) was right up my alley. The dresses are adorable! I can just picture my niece in them! My favorite when I was little was one of those one piece jumpers with giraffes on it. I wore it as often as I could. OH how I wish I had a girl! Good thing my sister in law is having one so I could give it to her. :) These are absolutely adorable and so so sweet. I loved my plain white Keds. I don't know why, but I really did love them. I distinctly remember getting so upset anytime I got one single smudge on them. Those dresses are so sweet, and I've got a one month old girl. I remember loving to wear my Mickey Mouse sweater dress that was hand-knit by my mother. Such lovelies! My favourite dress was soft pink and grey, made of a sort of flannel so it was really cosy. My friend had exactly the same dress and we liked to wear them together and pretend we were sisters! love it! i had a little sailor dress that my mom loved to put me in. that is until i spilled fingernail polish all over it. My favorite outfit was my light blue sundress. It was the same color as Sleeping Beauty's dress and I thought I looked just like her when I wore it! Ooohhh! These are to die for! When I was little I had a blue floral short and shirt set. The shorts looked more a giant diaper cover than shorts, but they were meant to be shorts none the less. The shirt was more like a tank top and the straps tied together at the top of my shoulder. If I could have worn this every day, I would have. I would only wear things that were comfortable and that I could move in. Fashion was not a prerequisite! I had a dress with an apron attached and strawberries embroidered all over it. My mom still has it. I think its time to introduce my four-year old to the dress. i love that 3rd dress! my favorite outfit was a little zebra number, skirt and top. i think the max my mom would let me wear it was 3 days in a row. my childhood fave? ... my brown cords! A turquoise bubble dress. It was my mom's favorite outfit to dress me in. i had a sailor shirt and this light pink,hot pink and red striped skirt that i loved to wear! beautiful dresses! My wife is pregnant and will be due in a few months. This would be beautiful for the little one! I have visited her shop quite often with admiration, thank you! and, I loved to wear my dance leotard with pink shorts, my pink or purple stirrup pants with big shirt tied at the side, and to top it off my side pony tail and big big bangs! Wow. I really want to win this! I have a little girl who is 4 months old and she told me she is just THRILLED at the prospect of wearing something so cute! Of course, for me, a Gunnisac Dress made life complete. I can't remember my favorite outfit. I do have a story of my mom taking me to a store as a toddler and trying on red patent leather shoes. I would not let them take them off and she had to buy them. 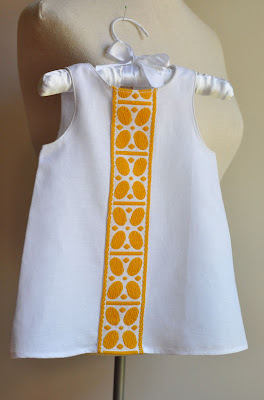 My granddaugter would be honored to wear such a cute little dress. Do they come in size two? I am not really quite sure when my fashion sense kicked in, but I had a pair of navy blue sweats, blue nike high tops, and a white ratty shirt that I wore with my hair slicked back and an awful headband. I wish I had something as cute as this little dress!! I love the beautiful simplicity! i loved my white skirt from the benneton.. always a staple.. I loved wearing anything out of my big sisters closet. With or without permission. Just being hers instantly made the clothes cool and grown up. Now, I still wear her clothes, but she wears mine too! Those are just beautiful! I love them! My favorite outfit as a little girl was a hot pink one-piece atrocity with legs, sleeves and a ruffle around the waste...the whole 9 yards. It had bold black polka dots and a big, thick elastic belt. Seriously 80's and hideous. But, oh how I loved it. I loved a wrap around summer dress that I had. I wore it until it was way too short. With white sandals of course! My 11 week old Julia would love one of these! I grew up in southern Georgia, and my mom always purchased the most amazing smocked dresses for my sister and I. I wanted to wear them everywhere! School, church, playing pretend in the yard....they are packed carefully away for when I am a mom of little girls! Thanks for this sweet giveaway! I had a pink (knock-off)"Member's Only" jacket when I was in elementary school that I wore YEAR round. Every picture of me winter, spring, fall and SUMMER has me in it wearing this pink jacket. My mom hated it. My teacher's hated it. The ladies at my daycare would try to get it off me and I would cry. I have no idea why I was so attached to this particular article of clothing, but I was. I have 2 little boys, but a sweet sweet baby girl that I car for that would look absolutely adorable n one of these dresses! Beautiful dresses! I was the only girl and my parents bought me some pretty cute dresses (at Robinsons and Broadway in Los Angeles). When I was around 4 years old, I had a *fantastic* babydoll style dress with hundreds of organ pleats. The fabric was white with purple flowers all over it, and to this day, purple flowers are a favorite of mine. I've never had another dress that twirled so well as that dress did. I wore it as much as I was allowed. Thinking of it now, that dress is probably one of my 5 earliest memories. Thanks for offering the giveaway. Katy's dresses are so cute! i loved my red and white dress my dad got me and my twin sister from europe. it even had the cute white apron to go around our waist! My favorite outfit as a child was a grey velvet dress with a pink satin sailor type collar. I loved it because not only did my mom make me this dress, she made a replica for my baby doll. We matched! I would only wear things that were purple. Apparently anything other color I wore "hurt", so my mom would always have to get something purple on me. I would love to win a sweet dress for my 2 month old! They are all so beautiful. I love a baby girl in a dress! My favorite outfit to wear also involved a tutu. I'd usually pair it with my Michael Jackson cassette player with headphones. Song of choice? "Gloria" by Laura Branigan. Sigh, those were the days. My favorite outfit was this pink floral "princess" dress my mom made me. As embarrassed as I am to admit this. . . legwarmers. Mine were purple knit, with a cat pattern . . hideous, really. But i LOVED them when I was about 7 years old. My favorite thing to wear when I was young was a light blue nightgown with flowers on it...it had ruffles and I would pretend I was a princess whenever I wore it! Both of my grandmothers used to sew us clothes and I loved them! The dresses and little summer suits were the cutest. My favorite was an orange and white dress. I literally wore it until it wore out. I'm sure my Mom hated that dress by the end, but she knew I loved it. And I am in extreme love with that last darling dress with the yellow fabric down the front. So sweet! The summer between kindergarten and first grade I accidentally left a pair of pants at my grandma's house. They were homemade, blue polyester, and had holes in the knees. You know, "play clothes." But my grandma, creative and resourceful woman that she is, patched the holes in the knees with appliques: an apple on one knee, and a worm on the other. This patch job elevated these play pants into my favorite pants, especially since I received a lot of compliments on them. I still have the pants. You're youngest of seven? I'm the middle (or #4) of seven! Not too common anymore. Oh! my favorite was my "cheerios in blue milk" dress :) wore. it. every. chance. i. got. we have a new baby girl coming into the family this summer --- yeah! love the sweet and simple dresses -- thanks for the fun giveaway! my twin sister and i used to love wearing our 'peppermint' dresses. she had blue stripes, and i had pink. they were so perfect for twirling. I don't remember any outfit as much as I remember my pair of clogs. I loved those things! They were a burnt red color and the sound they made were fantastic! Beautiful dresses! My grandmother made my favorite childhood outfit, just a simple sleeveless top and shorts from a blue Hawaiian fabric. I cried when became too small! My cousin just found out (20 minutes ago) that she's having a baby girl! This seems too perfect. I hope I win it for her, because I know I can't sew one that will even come close! oh, and i almost forgot. my favorite outfit wasn't an outfit. apparently i loved running around naked or only in my diaper! i loved to play anything dress-up with my little sisters. i'm going to say my favorites were the nightgowns my grandma had made for me. As a kid I wore this floaty blue floral dress of my mom's. I don't know if it was a nightie or what, but I thought it was the most beautiful thing ever... Looking back though, it probably was reminiscent of Mrs. Roper. I don't think I ever saw it on my mom. When i was young we always wore beautiful smocked dresses. I don't think I was so fond of them at the time, but I would love to find one for my daughter! These dresses have that nostalgic feel as well, they are beautiful! I loved to wear my grandpa's work boots. anytime I could get my hands or feet on them I wouldn't let go. Many pictures of me and those boots. Every Friday in first grade, my best friend and I would dress in our Friday best: My best friend in her white and red twirly dress and me in my red and white polka-dotted Minnie Mouse dress. I remember the first time I laid eyes on it at the store in Disneyland. I knew I had to have it because I wanted to be just like Minnie. It was the exact replica of Minnie's dress. I was over the moon! Every Friday my BFF and I would come to school wearing our dresses and acting like the girliest of girls, twirling around in our twirly dresses and make-believing that she was a princess and I was Minnie Mouse. I wish for my daughter to have the same wonderful, make-believe times in her future. i can't really remember a favorite outfit, but i do remember that i LOVED wearing tights. I only have a son. Winning a beautiful dress like these would only result in wishful thinking! But still, I'd love it. seriously, so beautiful. katy is one talented girl! when i was little, my very crafty mama made me a life-sized Raggedy Ann. and a matching dress for me! it was super cute! Beautiful dresses! A favorite outfit of mine as a kid included pink corduroy pants with a matching top. I loved the pants so much, my mother let me wear them to church one time! my mom used to make the majority of my clothes and my favorite was a watermelon outfit. it was a green seersucker dress with a watermelon for the collar. and of course a matching purse! she spoiled me with cuteness. those dresses are so cute! my favorite outfit when i was young was a flowered Sunday dress - I wanted to wear it every day of the week. I loved my red coat with white fur trim. If I found one in my size now I'd probably buy it! i would not leave the house without a bonnet to match my girly dress. there was a coat/hat rack by the front door and I pulled it over countless times reaching for the perfect one! my sweet 12 week old would be thrilled to own one of these handmade dresses! My favorite dresses were always hand-me-downs from my sister. I have 6 brothers and only one sister, so she was the coolest in my mind. She is also 7 years older than me, so by the time those hand-me-downs fit me, they were woefully out of style (I didn't care). there's nothing I (and June) would love more than one of these sweet dresses. I wouldn't leave home without my red clogs that strapped around my ankle. a night gown that twirled when i spun around. didn't every little girl have one of those? i loved it. i had a tiny navy blue & golden yellow apron with a raggedy annie applique that my mother hand sewed for me. i made sure it complemented every outfit i wore. so many sweet memories involving that apron. the dresses are lovely and i really appreciated hearing from the woman behind the creations. hearing about all her little ones. always a dress, full skirted with a hand knitted cardigan on top. I had no waist and so in every photograph my english knickers were always hanging down below my dresses! I would go anywhere my mom would let me in her late 70's - early 80's super hi-heels. I would usually accompany them with red tights that I called my "lylons"
I insisted on a dirty, ratty old T-shirt that barely covered my pudgy 3 year old tummy. A red dress with white polka-dots and lots and lots of ruffles. Paired with a pair of glossy white shoes, I felt beautiful. I rarely took it off. I was four. Where should I start... my "I Love Tom Selleck" pajama's, or my tight purple corduroy pants!! These dresses are so cute! Thanks for sharing her shop with us all. My favorite thing to wear when I was little was my red pj dress. I would twirl around and feel like a princess as it danced with me. my favorite thing to wear as a child was ANYTHING of my older sister's, now my baby girl is following in my footsteps and loving any article of clothing that belongs to her big sister...what beautiful dresses for my girls to lovingly "share"
i loved when my grandma let me try on my big dolls clothes they were always too small, but my favorite thing to wear. oh those are some beautiful, beautiful dresses. i had a princess dress i loved, inspired by the movie pollyanna. it was pink with crinoline underneath and when you wore it, you couldn't help but twirl. i once had a doll that was nearly as tall as i was. i was probably 3 years old at the time. the doll had this short light pink outfit, a dress i believe. i always wanted to try it on, to be like my "life-size" doll, but it never worked. :( otherwise, my other favorite outfits were usually the ones my mom made. i only hated them when the kids at school made fun of me for having homemade, handmade clothes. otherwise, i loved the frills and lace and beads and trim my mom would add to my shirts and dresses. (my mom wasn't much of a designer... so they weren't particularly stylish, but fun!) i remember this one sweat shirt i had - a hand-me-down - that had a rainbow of satin and over time the satin wore down and my mom had to rip it out. i was distraught. the sweat shirt was still in good condition. (the satin material was thin and cheap-y). so she filled in the gaps with ribbons and beaded fringe trims where the rainbow colors ought to have been. i loved it! Those dresses are adorable. I think my little one would look quite nice in one of them. These are gorgeous and simple! I used to love a soft knit blue striped shirt with a color my mom made me. In fact, she had to make me one every few years as I outgrew them. Oh how lovely - would love to win!I loved wearing this hand knit sweater by my grandma...my fave! So adorable! Can't wait to be able to play dress up with my baby! I had GREAT fashion sense as a wee one...my favorite outfit was jean overalls AND frilly white gloves :-) I thought those gloves made me so grown up! These dresses are too cute!